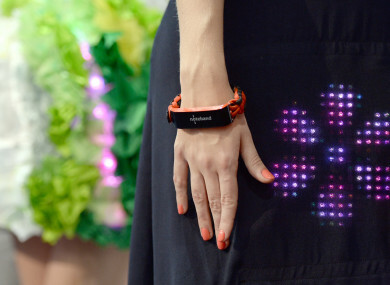 What does wearable technology mean for the way we get dressed? The way we live is changing fast. Every fortnight in our Future Focus series, brought to you by Volkswagen, we’ll look at how one aspect of everyday life could change in the future. This week: your clothes. IN THE SECOND Back To The Future film Marty McFly gets some pretty impressive gadgets, including self-lacing shoes and an auto-drying jacket. Although the movie guessed some things correctly about what life would be like in 2015, these aren’t exactly garments we’re all wearing now. When we think about wearable technology, plenty of examples from science-fiction come to mind, but some of these concepts are actually becoming less Hollywood and more reality all the time. For example, we’re all getting more accustomed to smart accessories, with the likes of Fitbits and smart watches growing in popularity. According to research firm Gartner, global spending on wearable devices is forecast to reach $42 billion in 2019, including $16.2 billion on smart watches. Looking further ahead, however, one of the areas forecasted to experience major growth in the future is smart clothing. Shirley Coyle is a designer and engineer who has been researching wearable technologies for the last 15 years and now works as a consultant. She says that there have been “big advances” in this area in recent years, but we have really only seen the tip of the iceberg so far. “Smart watches are dominating wearable tech now and probably will for the near future. But after that we’ll see more smart glasses, head-mounted displays with VR, hearables or ear-worn devices, and then it’ll be smart garments. So far a lot of the big wearable tech on the market has been focused on fitness, from step counters to sensors that track biological measurements, which has started expanding from smart accessories into smart clothing. Companies like AiQ, Hexoskin and OMsignal have developed biometric exercise clothes that measure your vital signs, while the Nadi X yoga pants can sense your body movements and vibrate when you need to adjust your pose. But now companies and designers are beginning to looking beyond wearable tech for just fitness fanatics and gadget geeks, trying to find ways that smart clothing could become a part of everyday life in the future. In 2017, Google teamed up with Levi’s to create a smart jacket that connects to your phone. Designed with cyclists in mind, the Jacquard denim jacket allows wearers to play music, find directions or answer calls by just tapping on their sleeve or making certain gestures with their arm. The two companies have continued updating the product and are gradually adding more features. There are many useful things that could be added into our jacket sleeves in the future – like a way to buy your coffee with a contactless payment or scan yourself into the office. But Coyle adds that healthcare is probably “one of the most valuable areas” where smart clothing could be applied in the future. This could range from clothes that monitor health signs over a long period of time and detect any unusual changes in the body, to clothes that give extra ‘muscle power’ to help your posture or support people in physical rehabilitation with their exercises. “The best things would be garments that can monitor health but can also do something about it. Like wearing something that measures blood sugar for people with diabetes, but could also provide insulin when you need it,” she says. But not all ideas for futuristic clothing are focused on connecting to your phone or an app. There’s also a lot of work going into smart materials and textiles – particularly those that can be easily washed, unlike the $350 Google jacket. This includes creating fabrics that regulate temperature and could cool down or warm up the wearer if they’re too hot or cold. Sports company New Balance is working on a moisture-responsive outfit where the breathability of the material changes when the wearer gets too sweaty. Alongside these, concepts are being tested that could use technology to personalise our clothes. “I think over the next few years designers are going to start working more with technology to come up with creative things. I suppose at the moment it’s very focused on health and fitness and people haven’t really explored what else is possible,” Coyle says. For example, in the future we could be seeing more clothes that change colour or light up with the push of a button or even a change in temperature. “Adaptable materials and flexible displays are going to change the appearance of clothing. So you will be able to change the colours or the patterns of the garment you’re wearing,” Coyle adds. In another step towards greater personalisation, Coyle is currently working with an Irish company to create a high-tech garment that aims to make buying new clothes a whole lot easier. “We’re developing a smart garment that would automatically measure your size using sensors. This would connect to your phone and those measurements would be sent to a tailor to get something made, or it would recommend different brands, showing which style or size would suit you best. So while we may not have a Back-To-The-Future-style self-drying jacket just yet, there are plenty of possibilities ahead for high-tech clothing, and it seems as though this is an area that is just starting to get stitched together. “As designers get involved more and the materials improve, wearable technology is going to be integrated into our everyday lives in a better way,” Coyle adds. The future is nearer than you think. Discover Volkswagen’s range of current and next-gen electric vehicles at volkswagen.ie/electric. Email “Goodbye sweat patches, no more 'what to wear' worries: The future of putting on clothes”. Feedback on “Goodbye sweat patches, no more 'what to wear' worries: The future of putting on clothes”.